Just ahead of the release of the final trailer for Fantastic Beasts: The Crimes of Grindelwald TODAY, a batch of nine new character posters has been released for the upcoming film on Twitter by the movie’s official UK account. Each poster features a profile shot of the movie’s characters with text that notes something of interest about the characters. 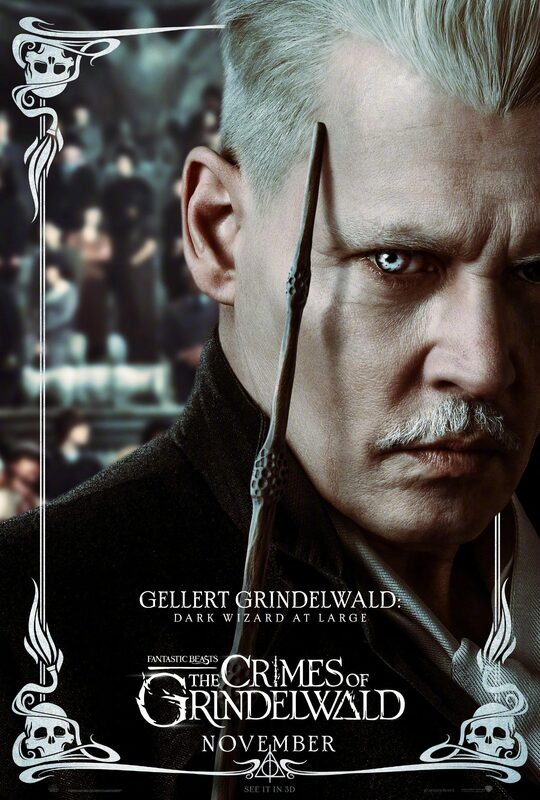 Of course, one of Johnny as Gellert Grindelwald was among them, describing him as “Dark Wizard at Large“. We added the poster in high quality to our photo gallery. Enjoy and stay tuned for more to come. Especially the trailer. A new featurette for Fantastic Beasts: The Crimes of Grindelwald takes the Potterheads back to Hogwarts, school of witchcraft and wizardry. 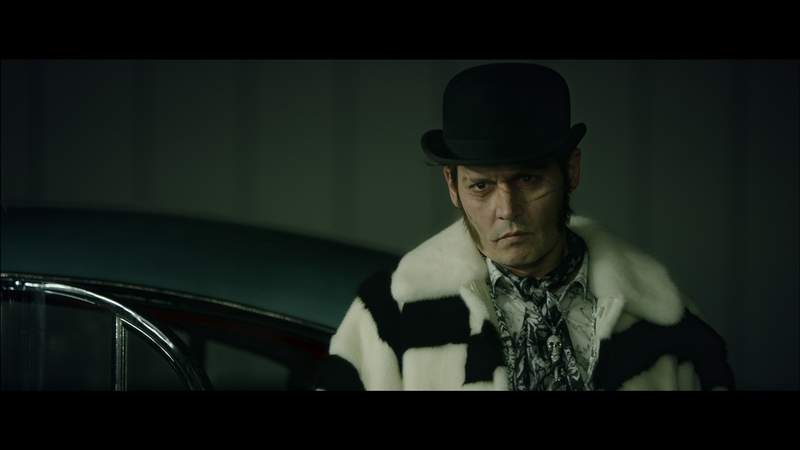 Unforunately, the featurette does not contain any new scenes of Johnny as Gellert Grindelwald but I wanted to share the video anyways since I know that many of you are excited about the movie itself. “I felt quite sentimental going back to Hogwarts,” author and Fantastic Beasts screenwriter J.K. Rowling admits in the featurette. “Those names, the stories, the histories that sit in the back of our minds from the Potter series begin to weave their way into Beasts,” Fantastic Beasts star Eddie Redmayne muses in the featurette for the second film in the Harry Potter prequel series. But of course, this Hogwarts is not the one we grew to love over eight Harry Potter movies, with Fantastic Beasts taking place 70 years earlier. This is Hogwarts in the 1920s, and… it doesn’t look all too different. Other than the clothes by the teaching staff, the bright-eyed students in their Hogwarts robes all look oh-so familiar. 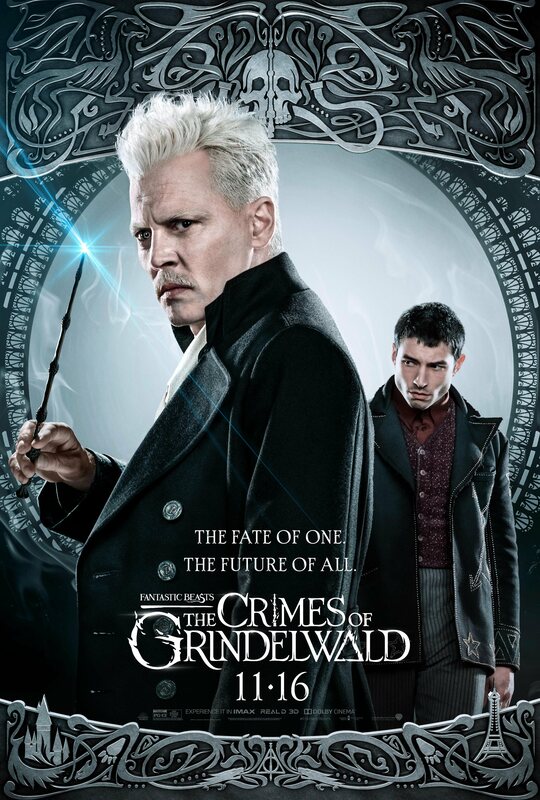 Hogwarts will probably be the one comforting feature of The Crimes of Grindelwald, which escalates the war that the titular dark wizard (Johnny Depp) is waging against the wizarding community. The second Fantastic Beasts film is set to be darker and more grim than the last — but at least Hogwarts remains untouched, for now. Fantastic Beasts: The Crimes of Grindelwald marks the most anticipated fall 2018 movie. Fall is almost upon us, which means crisp cool days, trees alive with color, and a new slate of movies. Before every season, Fandango asks theater-goers which films they’re most anticipating, and the fall 2018 lists are out. 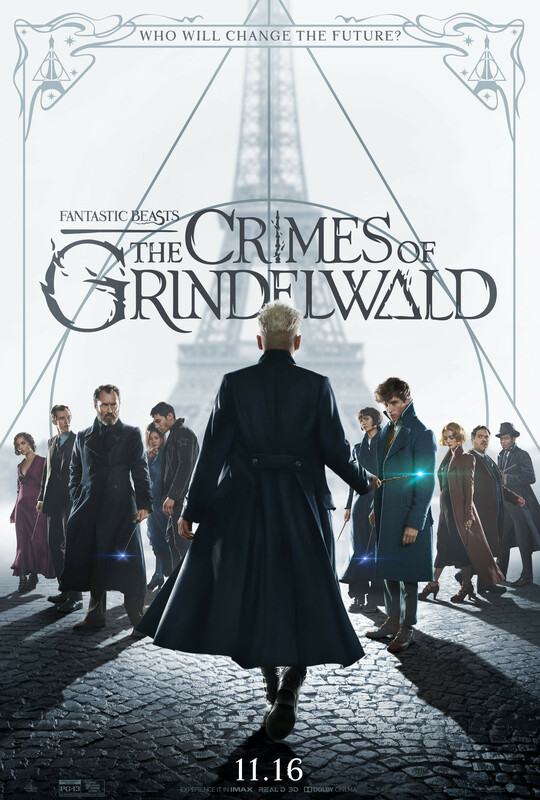 Several genre movies cracked the top five, but the top dog is Harry Potter prequel Fantastic Beasts 2: The Crimes of Grindelwald. Fantastic Beasts also tops the list of Most Anticipated Fall Family Films. Sadly, one of Johnny’s movie projects, the upcoming Notorious B.I.G. film City of Lies,” has been pulled has been pulled by Global Road Entertainment a month before it was slated to hit theaters. The movie was scheduled to be released September 7, 2018 but is now undated, a spokesman for the distributor said Monday. The feature is based on the book “LAbyrinth,” which tells the story of the police investigation into the deaths of rappers Tupac Shakur and Biggie Smalls. 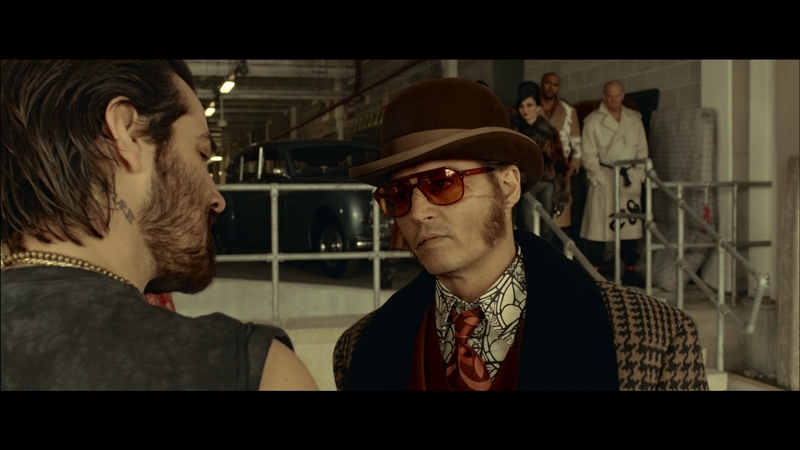 Last month Johnny was sued by a location manager involved in the production who said the actor punched him. Those of you who know me, know that I do not give much about rumors, but I wanted to let you know that it is claimed, that this has got something to do with the movie’s probably delayed release. The life of billionaire Matthew Mellon is considered to be made into a movie and Johnny is said to be interested to participate. Matthew Mellon led a fast-paced life of privilege before his unexpected death in April at age 54, and now actor Johnny Depp is reportedly considering playing the banking heir in a potential film about his life. Mellon descended from the Mellon and Drexel families of Bank of New York Mellon and Drexel Burnham Lambert and reportedly came into trusts worth $25 million when he was just 21 years old. 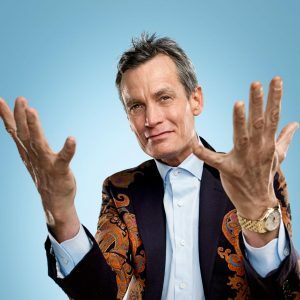 After graduating from the Wharton School at the University of Pennsylvania, he worked in fashion, telecommunications, and finance, most recently as global ambassador for the digital currency company Ripple Labs. Cryptocurrency is how he turned his millions into a fortune that’s been valued at more than $1 billion, thanks in part to a savvy early investment in Bitcoin recommended to him by the Winklevoss twins, Cameron and Tyler. He was also married twice—first to Jimmy Choo co-founder Tamara Mellon and then to designer Nicole Hanley Mellon until mid-2015. Yesterday, July 21, Johnny made a surprise appearance at 2018 San Diego Comic-Con during the Fantastic Beasts: The Crimes of Grindelwald portion of Warner Bros.’ panel in character as the evil wizard Grindelwald. For the majority of the presentation for the highly-anticipated wizarding world sequel, Johnny Depp wasn’t on stage and most in the crowd assumed that he simply was too busy to turn up at the event. However, toward the end of the showcase, he walked out on stage in full Grindelwald gear and delivered a speech in character. The speech help by Johnn focuses on the “good of humanity.” It was a classic villain’s point of view monologue, ultimately about how a lot of people are going to suffer for what he perceives to be the greater good. 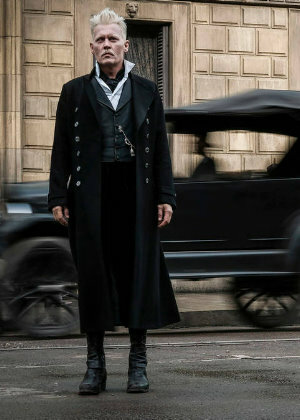 Johnny wasn’t revealed until the very end of the first movie, but that set him up to be a major part of Fantastic Beasts 2 and, in all likelihood, a fixture of future movies in the planned-five movie franchise. Warner Bros. also revealed a brand new trailer for the movie during the SDCC panel which you can watch below. A few photos taken of Johnny during his speech have been added to the photo gallery. Enjoy!